Welcome to the April 2019 edition of the Rhoscolyn community website. It has been developed to serve the local community of Rhoscolyn and Four Mile Bridge and its visitors. We hope you will have a good look round it. We want it to promote the image of the area, and to help everyone to make the most of what it has to offer. Rhoscolyn is a beautiful village, with fine sandy beaches and lovely countryside. With its sheltered bay, Borth Wen, it is a great spot for families as well as for sailors, kayakers and walkers. And the views from its two headlands are spectacular. Its beautiful church, St Gwenfaen’s, sits proudly on the hill overlooking the village and the sea. The very popular White Eagle, which serves some of the best food on Anglesey, is on the lane down to the beach. On this Rhoscolyn website you will also find some history and general background, including the facilities on offer locally, places to visit and things to see. We aim to keep the information on the site up to date and to add to it; please do send us your thoughts, ideas, suggestions. And best of all, your contributions. Such as stories and photographs for the News, Nature Watch, Pets and History pages, or your themed photographs for the Gallery. There is a contact link in the footer. PLEASE PLEASE name your pictures on the jpg before you send it – your name and what the picture is if not obvious. In the subject of your email put the page the picture is for. If you want to know how to save your your pictures as Jpgs or to name your photos as you save them, there are guidelines on the Gallery page. It really does help me, as I get hundreds and there is always the risk of attributing yours to the wrong person! This is where we select a photograph of Beautiful Rhoscolyn from those sent in. This stormy one is from Caro Wilson. If you have a photograph of our beautiful village that you would like to share with others, then do send it in to the address in the footer. The more we get the happier we are. Rhoscolyn is at the very southernmost tip of Holy Island. 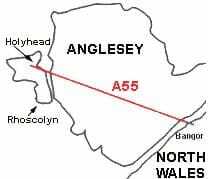 Take the A55 across Anglesey, leaving it at Junction 3 to Valley (Y Fali – not the one before that, to Valley RAF station). At the Valley crossroad turn left onto the B4545 towards Trearddur Bay. This takes you to Four Mile Bridge (Pont Rhydybont). To go on to Rhoscolyn, cross the bridge and take the next left turn. Just over a mile on and you will reach the turning down to the beach and to the White Eagle. If you want the Silver Bay site take the left hand turn indicating it a few hundred yards before you reach the beach turning. We thought this was easy, but nobody got it – it is, of course, frogspawn. If you have a picture of a curiosity do send it in (but tell us what it is please!). Here’s one from Caro – anybody know what it is? …which she has entitled Sam Teaching Peter to Slack Line – definitely looking foolish!